See Dr. OZ show CADEX Watch on Good Morning America. CADEX Alarm Watch Recommended by Good Housekeeping. Looking for the CADEX Medical ALERT? Easy Set-up Guide for your e-pill Alarm Watch. 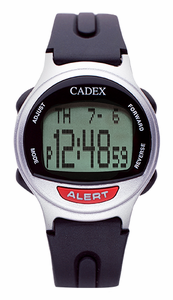 Listen to the Medical Alert CADEX Radio Advertisement | Visit CADEX Alarm Wrist Watch Web site. Over 50,000 CADEX Watches Sold! Watch a Short CADEX Video to see how it works. Recommended by Good Housekeeping magazine. TV Dr. OZ shows CADEX Watch on Good Morning America. Member tested & recommended by National Health & Wellness Club.